A fine collection of medals, militaria, postcards, photos etc will offered for sale in our 18th April 2018 medal and militaria auction, with varying estimates. 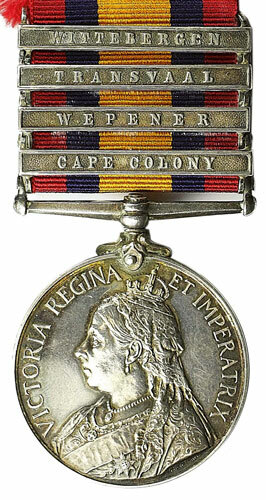 Lot 17 in the medal section is an 1899 QSA 4 clasps Cape Colony, Wepener, Transvaal, Wittebergen, to 3573 Pte J. Heathcote, Royal Scots. This is a rare clasp to imperial troops, as only 83 Wepener clasps were issued to the Royal Scots. Estimate £600. After the medals, there is a separate section of the collection offered in 52 lots. 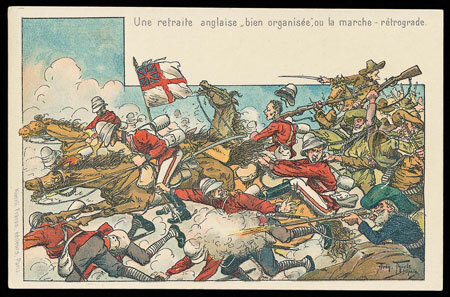 Lot 127 is an excellent collection of 166 mainly anti-British propaganda postcards with an estimate of £600. 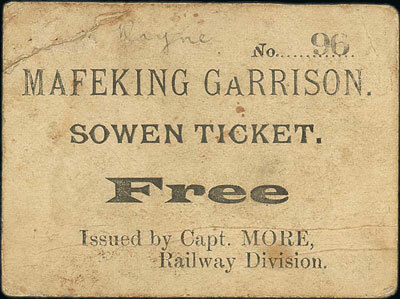 Lot 129 is a Mafeking Garrison Sowen Ticket Free number 96, issued by Capt More, Railway Division, estimate £350. Lot 136 is a 1900 Scottish soldier's tobacco gift tin with 2 of the original 4 tobacco plugs, bearing label "F&J Smith’s Yankee Plug and gift card presented to the Scottish Soldiers in South Africa". 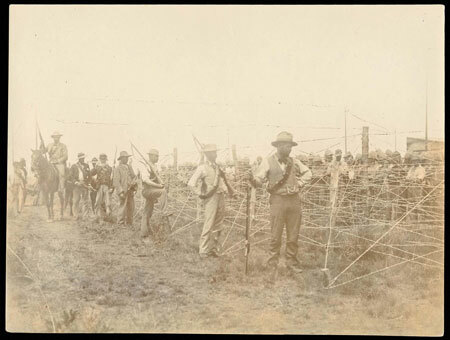 Also with fragile note “Taken from Boer Prisoner 22-10-00 at Commando Drift whilst shelling De Wits' rear guard". The estimate is £200. Lot 142 is a collection of photos, mostly 20.5cm x 14.5cm, including Durban docks, Durban street scenes, shipping, blown railway bridges, train crashes, British POWs (including 2nd Devons) in Boer camps. 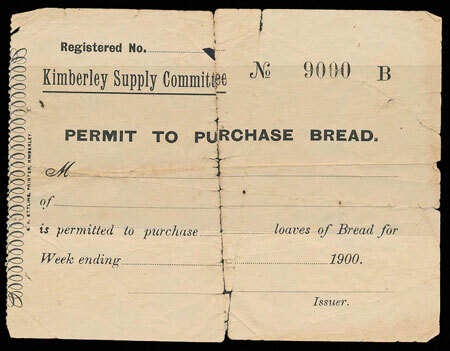 Lot 162 is a 1900 Kimberley Supply Committee Permit to Purchase Bread number 9000B, estimate £70. 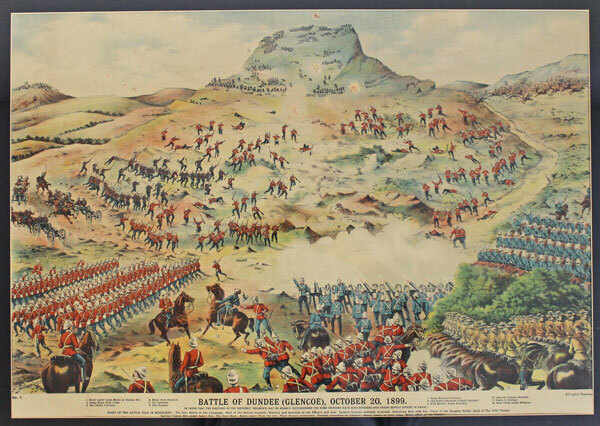 Lot 172 is an 1899 Battle of Dundee colour print No 1 by Sutherland, in modern steel frame, extremely fine. The frame measures 79cm x 57cm. There are also several lots in the banknotes section which follows, including lot 307, a rare Boer War Upington Border Scouts 1 March 1902 2 shillings K208, on cloth, handstamped "Issued by Paymaster B.S. 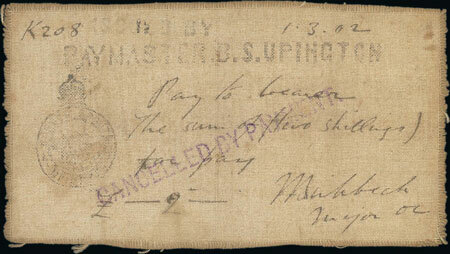 Upington", with manuscript inscription "Pay to bearer the sum of (two shillings) for pay", singed by Major Birbeck, with the unit handstamp to left, and cancelled stamp at angle “Cancelled by Payment”.